Maybe you found this Web Site because you are going to visit Fanning Island while sailing on the various HAL cruise ships, other ships or sailboats? Congratulations! You are one of the lucky few people in the world who will ever visit and see Fanning Island and its’ beautiful people and exotic scenery. Be sure to view all the video and news clips on this website’s MEDIA page to get a view of the island and some of the best information. Since 2003, we have been able to sail on various ships to help Fanning Island. Over the years, it has been a true Blessing to meet the many people on the ships (or on land) who have helped, traveled to, or wished they could have gotten on the island. People like a good friend named Nancy seen here when visiting Kona. She was on a couple of my past HAL sailings and has helped so much by taking many great pictures which are seen thruought this website. She has also helped many other times on her other sailings to the island by talking to passengers and helping with needs we might have. Thanks much Nancy! We are not affiliated with HOLLAND AMERICA in any way and desire that your voyage and visit to Fanning with them and other ships will be a wonderful experience that will never be forgotten. HAL has however been so helpful to our organization and the other passengers by allowing many supplies to be collected and delivered to the island during the various cruises they do. It is also our hope that you can help the island and not improperly influence its’ development or the people. There has always been caution on the side of HAL when it comes to passengers involving other passengers to help destinations such as Fanning Island. Since 2009, I had sailed on about 5 sailings with HAL, and over 25 sailings since 2003-2009 with NCL, to Fanning Island. There has always been a good working relationship between NCL and now the Holland America Corporate office, their ships and me when we partnered together to help the passengers and ship staff arrange and get donated supplies, and deliver them to Fanning. On every sailing, the ships allowed me to do private presentations to any passengers wanting to know more about Fanning Island and also answer their questions how they can help. Most all of the travel consultant’s information and pictures during their presentations came from our organization, so the passengers could get correct information about the island and visiting there. This was one way the ship did their soliciting for help to inform the passengers, without violating the rules. Rules of no solicitation were always reviewed with me at beginning of the cruise, and before every public presentation, and I abided to their satisfaction. There were no tensions, but always cautions on both of our efforts to inform the passengers, so no solicitation violations would happen. Viewing this website’s write ups and pictures of past cruises can show you the wonderful partnership we had with HAL to help the passengers and residents of Fanning. Now a word of caution regarding Feb. 2013 Statendam Cruise Critic Passenger Ann’s(rtdiva) comment she placed on the Cruise Critics Posts: “Soliciting donations via Cruise Critic before the cruise is acceptable but keep a low profile on the ship”. There are rules by CC about soliciting and collecting/giving donations on the CC posts for a destination. You should be careful about that if you write a post on the CC site. Informing the passengers off and while on the ship is approved, but yes, no solicitations on ship are allowed. With that said, Ann(rtdiva) I see you have been posting on the Cruise Critic roll call for your Feb 2013 sailing and show a desire to help get children’s educational books to Fanning. I have a need to try and get about 150 Highlight Children’s magazines (that the company donated) delivered. Would you or any other compassionate person like to help? Ideally, it would be more equitable to leave things with The Fanning Island Council Donation Committee to be shared with the 7 villages. During the 2011 sailings, the Donation committee was not serving with the best integrity we all hoped for and distribution of the supplies was questionable. Our January 2012 sailing allowed us to meet the new Clerk, customs official and school representative and they seem to now have an effective council committee for receiving and distributing your donations. The Island Mayor, Clerk, customs agent or Council representative should be near the government building where the council office and storage rooms are located, or at the information and donation booth at end of pier to assist you. Please check with Rich Smith rich@pacificcaremissions.org to find out the current recommended method of giving supplies so that they will effectively, and with integrity, be given to the people of the island and not be sold or kept improperly. It is our recommendation that you personally give your supplies as gifts to the people individually (if you can in a private setting and in a gift giving manner) but donating them to a general collection event on the ship or on the island is best. You can have fun visiting the sellers at the market area and finding people or kids in the villages to share your gifts with. Also suggested, is to tour on one of the locals tour trucks or bicycles (if available) up the island and give to people along the side of the road who are selling their crafts or allowing you to take their pictures. If the schools are in session during the week and not on the weekends or breaks, visiting the schools and giving your supplies is definitely recommended. There are 3 primary schools on Fanning, one Junior, one Secondary and one government boarding High School. Two schools are within walking distance of the pier. Those are the Junior and Secondary School (closest) andNCL Primary School (NCL Primary School which was renamed in honor of the NCL establishment of visits to Fanning in October of 1997). -Medical supplies for use in the 4 small island clinics are very much needed. Band-aids, cleaning solutions, hand soaps, wound care items and all other health care needs are most needed and important. Treating infections and health matters are a matter of life or death. To see a list of other health needs and supplies to donate view the WISH LIST on this http://www.pacificCAREmissions.org website. -Sports items, Frisbees, basket balls, tether balls, soccer balls, volleyballs, tennis balls, nets etc. -New or used tennis/sports shoes that can be used by our local soccer team. They often play soccer and volleyball with ship crew and passengers on ship day. The larger & wider the better, some have described most of the feet as wide-fat-flat “Flintstone type Feet” from going barefoot. – Some new and good condition clothing is helpful and make for great gifts to those in need, especially the guides that may help you. – Support the people. There are many opportunities to take pictures of people and tipping them is normal and well received. Usually $1 helps greatly. So, bring lots of single American dollar bills and plan on buying souvenirs at the market to remind you of your special visit to Fanning Island and helping the people with some much needed income. The Holland America Cruise Line has recently included visiting Fanning Island during their voyages to French Polynesia, Cook Islands, Fiji and Samoa Islands since January 2010. There are currently about 3 HAL sailings per year scheduled. Included on this website are newsletter write-ups (see: latest news) describing some of the recent sailings by HAL and the donations of life saving and essential needs of the island. Since 1997, there had been visits by a few of the NCL cruise ships that operated in Hawaii, but they discontinued traveling to Fanning in April of 2009 due to lost revenues and having to travel to a foreign port to fulfill the Jones Act. NCL chose Fanning as the closest foreign port. We have this to say for those of you who are now worried Holland America or other ships are wrecking the island: On all the different types of tourism, the cruise ship industry offers the LOWEST Environmental Impact. NCL, and nowHolland America going to Fanning has been a good thing for the island and country. Approximately 1,500 passengers arrive per ship, and for most of the day tour, spend their money and go. The Fanning Island Council however receives about $2 for each passenger. This money is a significant important source of income for the people of Kiribati where governmental wages start out at about $1,500 per year and the per capital yearly income could be around $500. Some of the money earned by the sale of handicrafts at the local market, which is set up during the passengers visit, is being used to help send the children to school for further education, provide communications with CB radios (there are no phones), 12 volt lights and batteries, radios, bicycles, solar panels, water needs, food, clothing and other important needs. Australian and US dollars are best currency. Weather: HOT and mainly fine with the possibility of short showers. After you get off your air-conditioned climate-controlled cruise ship, the island may seem hot and steamy. To prevent condensation on your camera gear after exiting air conditioning, place cameras in a sealed plastic bags (such as Ziplocs) and let it acclimate to same temperature as outside before using it. Where they cross make a microscopic dot. That is Fanning Island. In fact about once every 6 weeks the locals will see a ‘heavy lift’ container ship traveling from Santiago, Chile to Shanghai, China, and about once a month they will see the “Columbus Line” container ship on way to Sydney from San Francisco. They do not stop. Fanning in 1997 had one working tractor, 3 working motor scooters, one small flat bed truck, about 100 bicycles for the 300 families totaling about 1,900 people. Today is not much different, there are about 5 flat bed trucks, 20 motor scooters, 270 working bicycles and the population may be around 2,500. There are still no telephones, no electricity, no hotels, no golf courses, no airstrip, no hospital, and they are often out of imported food basics. In just the last couple of years, the secondary school and government building has been able to do satellite internet. A handful of residents may have internet using radio signals. Compared to the West there is nothing. -First of all, please try to be as sanitary and as healthy as you can be. The less germs brought to the island the better. Using the hand wash sanitizers on ship, on the Fanning pier or carrying a bottle of hand sanitizer (and extensively using it) could be essential to keeping the islanders (and yourself) healthy. If you are sick and could transmit your sickness, then please do not go to the island. The people may not be immune or handle a new virus very well. Their tolerances could be very low. -take an umbrella and rain gear the sun is so intense and sometimes rain squalls may happen. You can also use them to shoo dogs away! -take a small bag for the little things you might collect or buy. Do not pick up Cone shells. They can be hazardous and deadly if they are alive and you are stung. Ask first about dangerous cone shells or other non recommended items to handle or take away. Don’t buy Trident shells (used as horns and decoration). They are needed in the ocean. 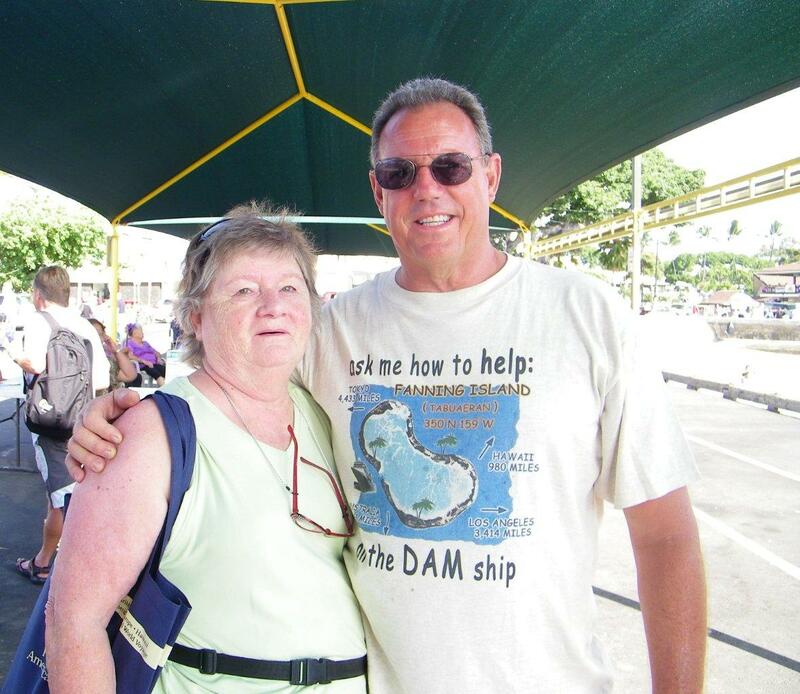 Hawaii resident Rich Smith, the director of Pacific CARE Missions, has been helping to find and deliver medical supplies toFanning Island since 2003 while sailing on the NCL cruise ships and being a lecturer during the voyages. Recently, he has completed the first HAL voyage to the island during the Jan. 2010, Nov. 2011 and January 2012 sailings. He has visited the island over 25 times now and continues to travel on the available cruise ships that would call on Fanning. He has been able to network with other people who are involved with building the new Health Center on Fanning and meet other important needs that others can help with. Presently he has been able to sail on the Rotterdam and usually brings supplies to help the Health Center and the people on the island, and tries to inform the passengers during the cruise, of the needs and activities available when the passengers arrive for their visit. Brownsboro Texas resident Carlton Smith is a very compassionate man who also collects supplies and equipment for Fanning, Washington and Christmas Island clinics and also the Capitol island of Tarawa and Christmas Island hospitals. For the most part, Carlton gathers and delivers most of the much need medicines the islands need. His latest visits and missions have been with visiting Drs. and nurses who diagnose cardiac needs, eye problems and other health needs. Many people have been blessed to have surgeries done locally or in the states, by the visiting drs. He also is responsible for providing the communications radios that the nurses and facilities use to communicate to each other and the Hospital onChristmas Island. There are so many other important people who have helped in past and it’s our hope you will see the needs and desire to help as well. Most of all, We hope your visit to Fanning will be a life changing and pleasant one! I am planning on packing a suitcase with extra toothpaste, toothbrushes, pencils, composition notebooks, topical ointments, etc. I am just one of many passengers aboard the HAL Westerdam whom are planning on donating supplies to these islanders. I look forward to my visit to this beautiful island. THanks much for your help. Hoping your visit was a blessing. Is there a plane landing strip there? Actually there is, but it has not been in use for many years and needs clearing to be operational. There is interest though in getting that done once a grader might me delivered there. I sailed to Fanning Island on a NCL’s maiden voyage in Dec 2001. Before we went onto the island some of the children were brought aboard the ship to perform for us. I can still remember how mezmorized they were of the ship, food, and people they saw for the first time. The island is beautitiful, the people are warm and sweet. Such a simple beautiful existence. I still have postage stamps and pics we took while there. None of what this article talked about was there when I went, NCL had only just begun building the storage building. It is great to hear from some of you 1st timers in the beginning era of Fanning Island visits by NCL. I would love to post any other information of what you were able to do back then during your visit and any photos you might have would be wonderful to see. I would like to make a page available on this website of early visitors stories and pictures for others to learn from. Would you have pictures to share and stories to start the page? to directly communicate with me. Looking forward to hearing from you. Thanks for your interest to help Fanning. Are you also a Cruise Critic member? That is great. Getting seeds for vegetables that grow in hot/dry climates is best. With respect, I would like to thank you and all those involve in donations sent to Fanning on behalf of the Fanning Island donation committee consisting of all council members representing the 7 villages of the island, for your kindly assistance. It is of great help to the community to receive donations and we appreciate it very much. The Mayor, head of the island for Local Government and members of the Fanning Island Council as well as the Clerk to the island council, regret and are sad to hear that all donations are not served with the best integrity. Donations received by all in future will be given to the people with integrity and none sold because we know what we received are gifts and are very special to us because they are at no cost. What is the current need for donations .Are reading glasses and sun glasses still needed?